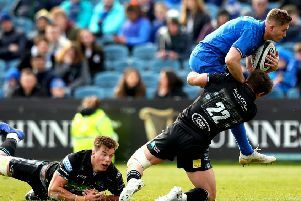 Glasgow Warriors co-captain Henry Pyrgos revealed yesterday that it was a fairly easy decision to extend his contract by two years and commit himself to Scotstoun until 2019. The scrum-half said that, now his future was settled, re-asserting himself as the Warriors first-choice No 9 and getting back in the Scotland mix were among his priorities – though winning more trophies with Glasgow was his driving motivation. “Not really,” said Pyrgos when asked if there was any difficulty involved in signing the contract extension. “Winning the [Guinness Pro12] championship two years ago was up there with the highlights of my career and I feel we can do that again. The decision of the 18-times capped player, who has captained Scotland on occasion, to remain added to the warm glow around Scotstoun following the weekend’s stunning win over Racing 92 in Paris, with the buzz now cranking up around Friday night’s return encounter. Pyrgos confessed that there were fleeting thoughts of trying new pastures but the lure of the place he now considers home was far too strong for the Dorset-born 27-year-old. “There always is [the temptation of moving] I suppose but I am desperate to play for Scotland,” he said. “I really love playing for Glasgow. Obviously I didn’t grow up here but this is my seventh season and I have seen the club develop and get better and better. “I love being here and now I know how much it means to the guys to play each week. It is nice to play somewhere where the guys are so committed to playing and getting better and trying to go out there and win trophies. “When I thought about re-signing, I thought about what I want to do and I want to win things. It will be all change at the end of the season when Warriors head coach Gregor Townsend moves on to Scotland and the highly-regarded New Zealander Dave Rennie comes in at Glasgow. “It is unusual when you stay at the same club and the head coach changes,” reflected Pyrgos. “Of all the transitions it could have been it is way up there with the best. Gregor and Dave have worked reasonably close. Gregor has been over there. They have similar ideas. We met Dave briefly a few months ago and he told us the stuff he would like to take forward and it is exciting. Pyrgos came off the bench in Paris at the weekend as he works his way back from a knee injury that kept him out of the autumn Test series. In that time his deputy at Glasgow, Ali Price, has seized his chance with club and country. The 23-year-old won his first cap in the win over Georgia with an eye-catching late cameo off the bench in which he set up Stuart Hogg’s second touchdown and, on Saturday, his quick thinking led to Glasgow’s vital second try against the French champions when the scrum-half tapped the ball off the base off the post for the score. “That’s rugby,” said Pyrgos of the competition. “Every year I have been here nothing has been handed to me or any individual. There has been Cus [Chris Cusiter], Niko [Matawalu], other guys who have been here trying to get the jersey.